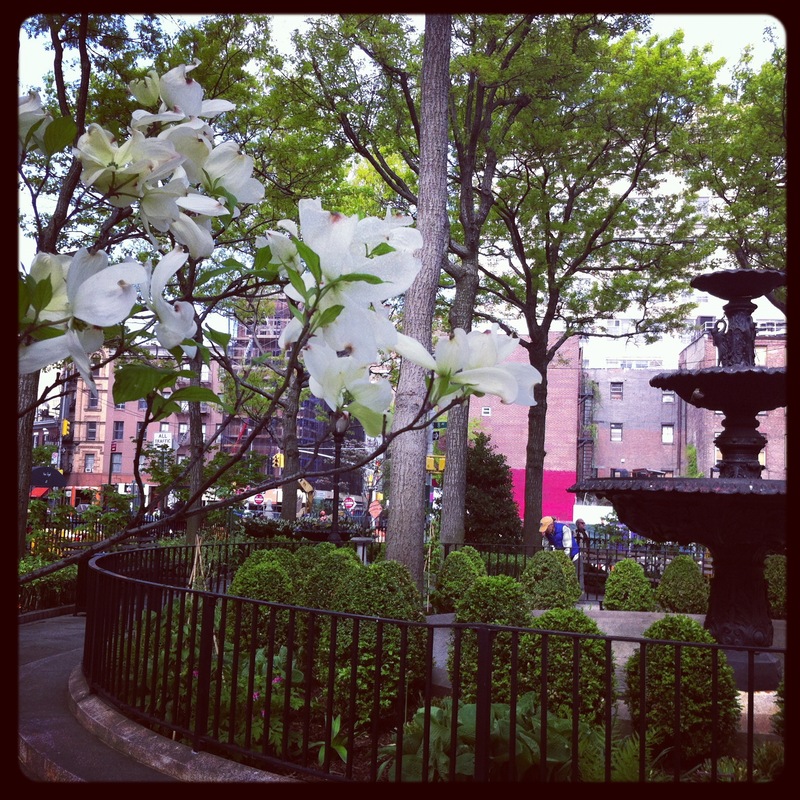 I am always on the look out for noteworthy small parks, community gardens and respites from the concrete jungle. 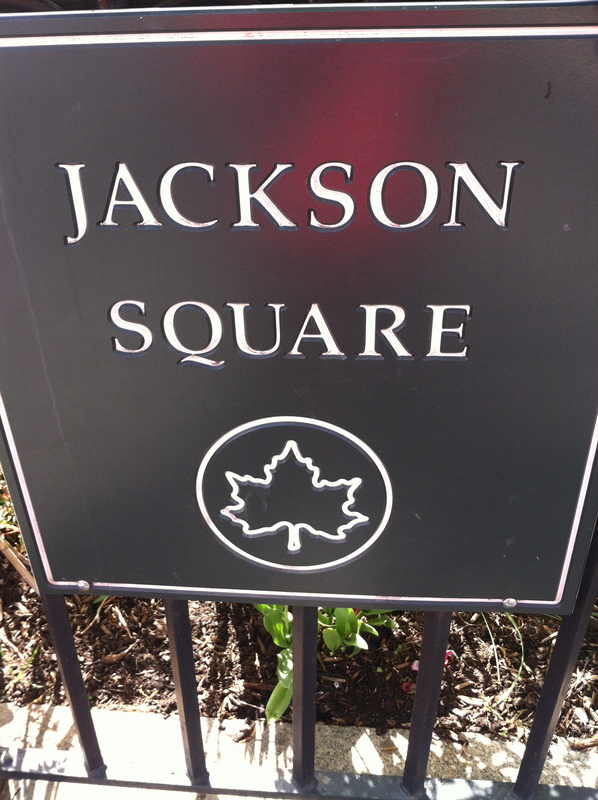 Just below 14th Street on 8th Avenue where Greenwich Avenue begins, there is a triangular park called Jackson Square bordered on the south end by Horatio Street. A dogwood tree in blossom (foreground). Boxwoods surround the cast iron fountain. The ironwork at the entrances and the perimeter fencing is original to the park’s beginnings, circa 1872. There are several pin oaks that are recorded as having been planted in 1930’s. The cast iron fountain was installed in a renovation finished in 1990. There are many nice plantings in this .23 acre park. 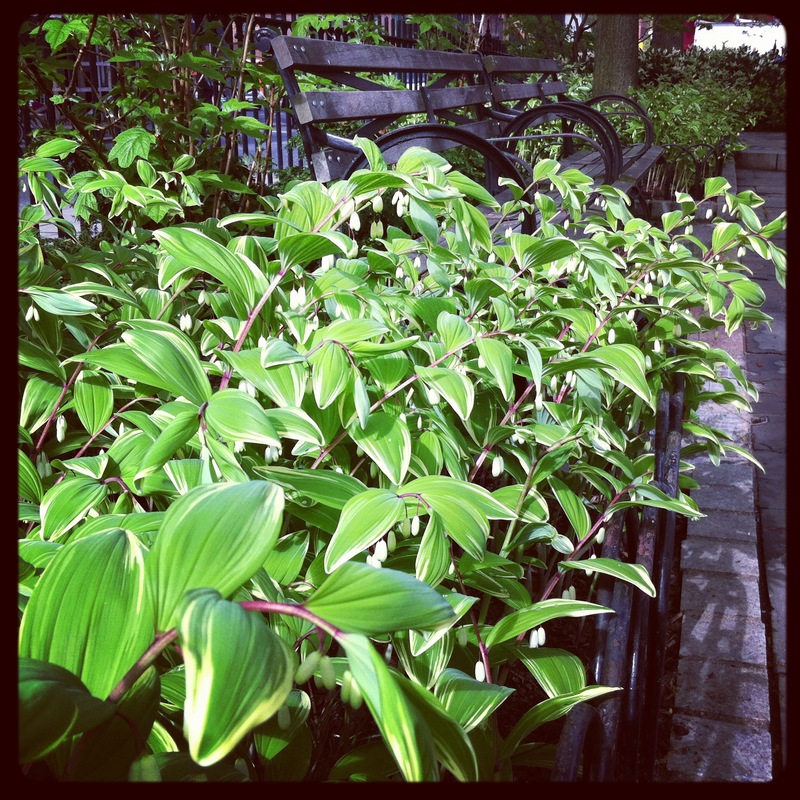 There are several groupings of variegated Solomon’s seal, a perennial plant that is wonderful in shade gardens. 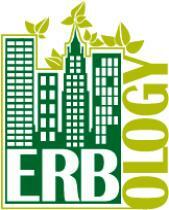 It’s easy to grow and will slowly spread throughout the years. 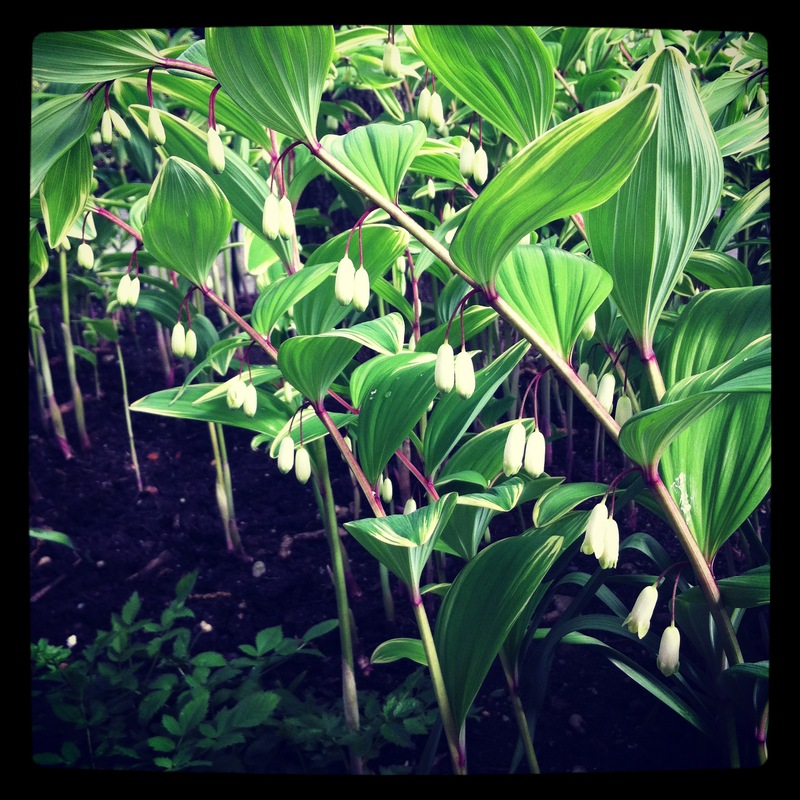 The structure of Solomon’s seal (Polygonatum) is delicate with its arches and hanging bell shaped flowers. It will bloom from early spring until autumn (when foliage will turn golden). Solomon’s seal with its sweet bell shaped flower. This grouping has Cherry Laurel (Otto Luyken) in the back left blooming with its white bushy flowers. The leaves are a lush dark green with a nice luster to them; it is an evergreen shrub and looks fantastic in the background of this planting. The evergreen shrub in the lower left is a Pieris Japonica (Forest Flame), with its white spring flowers in bloom, its new foliage is flame red and then fades to green as it matures. 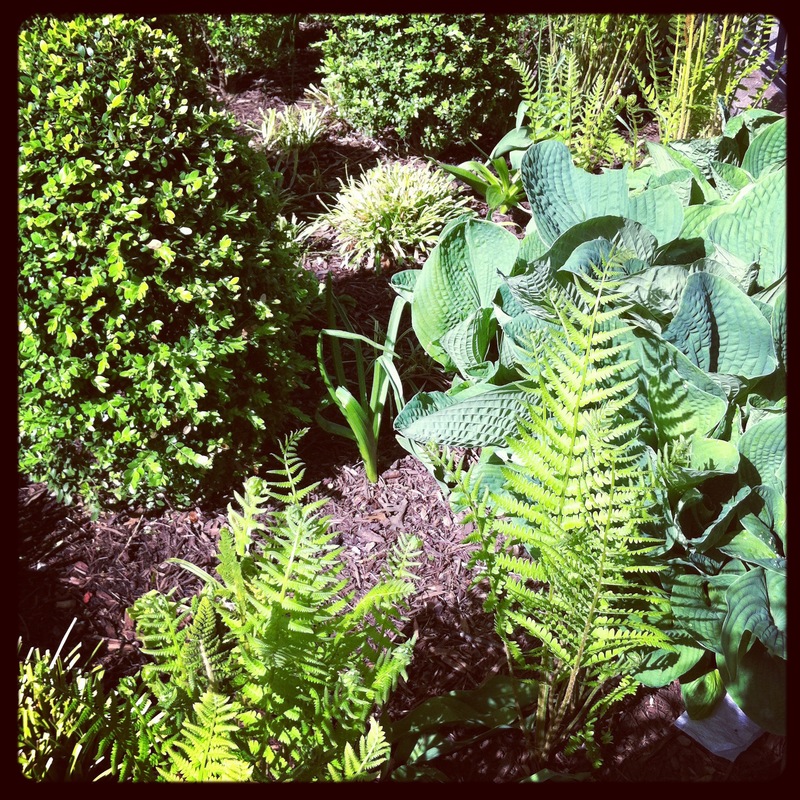 On the right side are Hostas (Garden Treasure) with their green middle and yellow edges. A shade-loving perennial, they are a great way to add color to your garden. Hostas come in a wide range of colors from an avocado green to a light blue-green with many types of variegated options. The blooms that appear in late-summer are white or lilac colored. 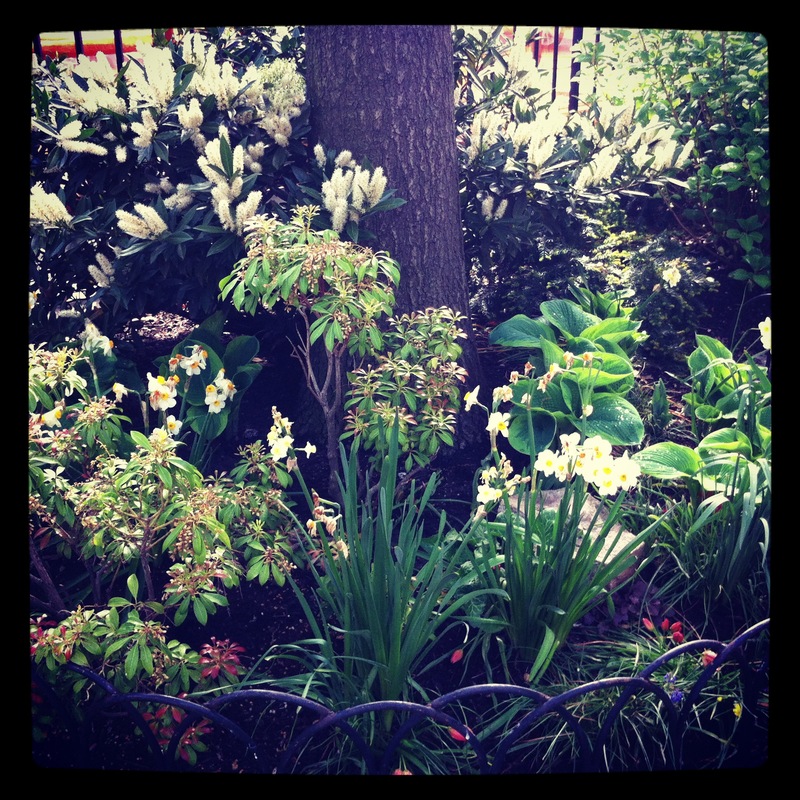 Mixed throughout the planting there are also spring bulbs: daffodils, tulips and muscari. 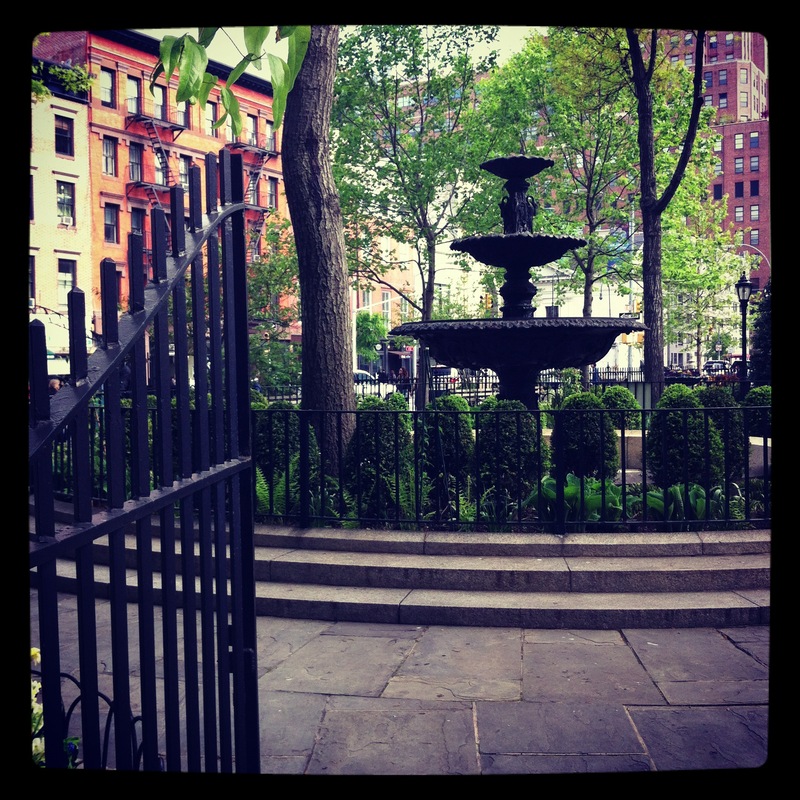 Several coffee shops flank Jackson Square so grab a cup to go and go relax on one of several benches!